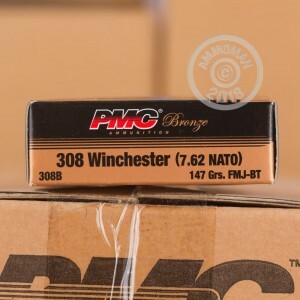 These .308 Winchester rounds from PMC are a great choice for an M-14, FAL, or other battle or sporting rifle. Loaded with a 147 grain full metal jacket bullet, they produce a muzzle velocity of 2,780 feet per second and excellent long-range ballistics. While they're not match-grade ammo, they'll give you some great groups! This ammunition is manufactured in South Korea by Poongsan, a top defense contractor that supplies the millions of rounds used by the Republic of Korea Armed Forces in stockpiling and training for a potential North Korean invasion. 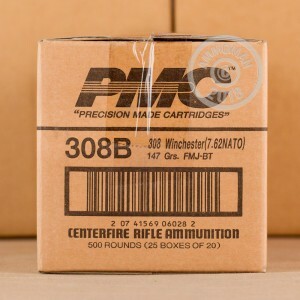 Poongsan manufactures all of their own ammo components and uses electronic quality control systems to ensure that its military and civilian customers get consistent, high quality ammo, hence the brand name PMC (Precision Made Cartridges). 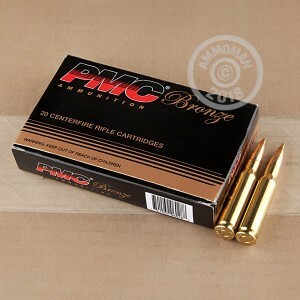 PMC Bronze cycles very dependably, accuracy is excellent. Haven't shot any of the ammo yet but it looks great and is clean. I have no doubt that it will fire flawless. Ordered ammo and two hours later it shipped. Placing another order now. Thanks ammo man!